Thank you for visiting Nottingham Shilohs! We hope our website has answered many of your questions regarding us, our dogs and inspired you to find out more about our breed, the magnificent Shiloh Shepherd Dog. We believe researching the breed, as well as Shiloh Shepherd breeders, to be an important step in your journey to find your new family member. Find a breeder you are comfortable with and if you feel you want to speak with us further, please contact us as we would love to hear from you. If you are looking to apply for a puppy, please use our puppy application form. Have questions about Shiloh Shepherds, Wolf’s Head Farm, us, our activities, or up-coming litters? Please feel free to contact Nottingham Shiloh Shepherds and Wolf’s Head Farm using the form below and we will get back to you as soon as we can. Nottingham Shilohs is located in beautiful Loudoun County Virginia just minutes from both Maryland and West Virginia. If you wish to visit us, please contact us (either via the form to the left or telephone) as visits can be arranged. We can be reached at 703.909.2984. Addison sharing a moment with Willow. 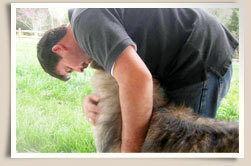 We try hard to further develop the bonds we have with our Shiloh Shepherds. Check out some of the activities we enjoy to do together. Website Content :: © 2009–2012 Nottingham Shilohs, All Rights Reserved. :: Photos property of Notitngham Shilohs or used with permission. Website Design/Programming :: © 2009–2012 Candid Paws, All Rights Reserved.